Timothy Matthew “Tim” Howard was born on the 6th March 1979 in North Brunswick, New Jersey USA, of African, American and Hungarian descent. He is a professional soccer player, best known for being a goalkeeper of the England Premier League club Everton, as well as the US national team. He has also played for the MetroStars, Manchester United, MLS Colorado Rapids, among others. His professional soccer career has been active since 1997. Have you ever wondered how rich Tim Howard is, as of mid-2016? According to authoritative sources, it is estimated that Tim’s net worth is as high as $8 million, which has been accumulated through his successful career in the sports industry; his salary per year is now $3 million. Another source is coming from his career as a writer. Tim Howard was born to Matthew, who was a trucker, and Esther Howard. When he was only three years old, his parents divorced, so he was raised by his mother. When he was in middle school, Tim was diagnosed with obsessive-compulsive disorder, and Tourette syndrome. Tim`s career began even before he matriculated from high school, signing his first professional contract with the New Jersey Imperials under head coach Sean Kenny. At the time, Tim`s personal trainer was Tim Mulqueen, who has been providing Howard free goalkeeping training lessons since 1991. Tim`s career began to improve step by step, and after only 16 appearances, Tim was brought into the MetroStars, by Mulqueen. Tim stayed with the team from 1998 until 2003, when he was bought by the English premiere league team Manchester United for $4 million. During his time at the MetroStars, Tim`s net worth began to increase dramatically, thanks to his great performances, which subsequently gained him a highly paid contract. In his first season at Manchester, Tim was the team`s last line of defense for 32 games, and was been quite successful, as in his first game he saved a penalty in the Community Shield match against Arsenal. Throughout his first season he had several fantastic performance, which cemented his position as the first goalkeeper. However, in the second season he became prone to mistakes, and was often switched with Roy Carroll on the goal line. It all led to the signing of the Dutch goalkeeper Edwin Van Der Sar in 2005, and Tim was loaned to Everton. However, thanks to his great performance at Everton, he became the first choice goalkeeper in 2007, after signing a contract worth $5 million over five years, which certainly increased his net worth to a large degree. In 2012, his contract was extended until 2016, however, his form began to decline, and for the following season he was expected to serve as a substitute for Joel Robles. Tim therefore left Everton, signing a contract with the Colorado Rapids and returning to the MLS, which has also added to his net worth. During his team career, Tim has won several recognitions and awards, as an individual as well as part of the team. In 2001 he was the MLS Goalkeeper of the Year, and was selected into the MLS Best XI two years in a row, in 2001 and 2002. With Manchester United, he won the FA Cup in 2003-2004 season, and Football League Cup in 2005-2006. Apart from his successful career in club competition, he has also been successful with the USA International soccer team, whichhe first joined in 2002, and has played ever since, making 108 appearances and winning the CONCACAF Gold Cup in 2007. Collectively Tim has played over 700 first grade and international games. Howard has also been recognized as an author, publishing an autobiography with his history of Tourette syndrome, entitled “The Keeper” in 2014, which also represents a part of his income. 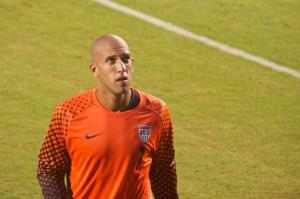 Speaking about his personal life, Tim Howard was married to Laura Howard(2003-12), with whom he has two children. In free time, he is very active in work with children who suffer from Tourette syndrome, and as a result he was namedMLS Humanitarian of the 2001 Year. He is also a big supporter of PETA. 1 Signed with Manchester United from the New York/New Jersey Metrostars on 15 July 2003 for a fee of £2.3 million. 2 Debut with Manchester United was on 10 August 2003 v Arsenal (Community Shield).